Perhaps yearning for a bit of nostalgia, I picked up some Boar's Head Black Forest ham at Key Food this weekend. I gave it a spin on a sandwich with some Muenster cheese, Kewpie mayo and Dijon mustard on Stroehmann potato bread yesterday, and it tasted just like I remembered. Granted, this was Boar's Head ham, which wasn't widely available in 1990s Colorado. This is a finer ham then I'm used to. Then again, I'm fully on board with Boar's Head's marketing claims at this point, so my judgement is clouded. I'll close with some information found on the Association of the Black Forest Ham Manufacturers' website (yes, that's a real thing). As the association says, Black Forest ham "offers enjoyment pleasure without a bad conscience." Indeed. The ABFHM has provided ham fans with an impressive guide to incorporating Black Forest ham into every meal and snack you eat in a 24 hour period. My favorite part is their use of the phrase "round off the ham day." Versatility on a plate has a name: Black Forest Ham is a delicious and tasty companion through the whole day. 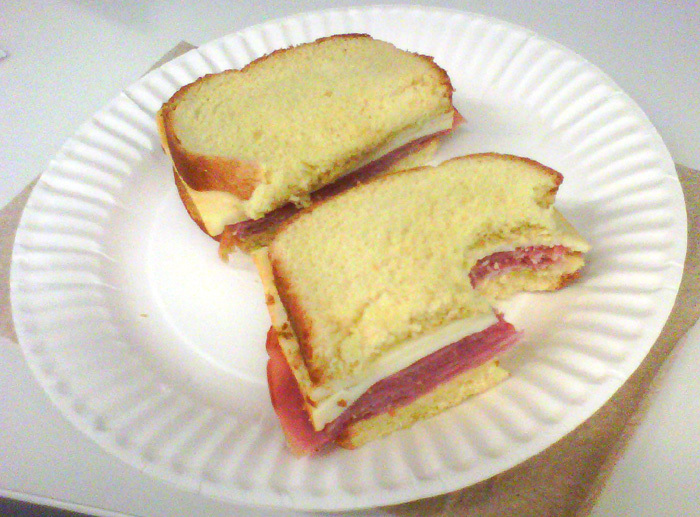 A slice of fresh farmer’s bread, some butter, and some finely sliced ham to top it off – a good way to start the day. For many people, Black Forest Ham is a classic breakfast when they rise and shine. It gives you energy, tastes great and fills you up. At Sunday breakfast or a holiday brunch you simply can’t do without it. And if you are in the mood for a snack, a hearty ham power-snack is just the thing. Hash browns with ham and avocado, a rustic ham-on-toast with fresh herbs – yummy and healthy all at once. Lunchtime is the time for creative ideas for Black Forest Ham. Depending on the season, it is always on the lookout for excellent companions: be it the plain approach, with fresh asparagus, rolled up with vegetable filling, baked with potatoes, cut into cubes in a rocket salad risotto or wrapped around turkey breast – it is simply delicious. There need not always be an elaborate menu. Ham keeps well (best of all hanging in a linen bag, cool and dry), while it can be cut into convenient portions and goes well with many things – a slice with fresh melon or on a crispy piece of toast with onions. 7 p.m. Then perhaps a light carpaccio or a vegetable salad with ham strips to satisfy the tummy and round off the ham day. With a contented feeling that you have eaten healthy food, and you are ready for the next day with all its culinary delights.